Sha Na Na is an American rock and roll group. The name is taken from a part of the long series of nonsense syllables in the doo-wop hit song "Get a Job", originally recorded in 1957 by the Silhouettes. 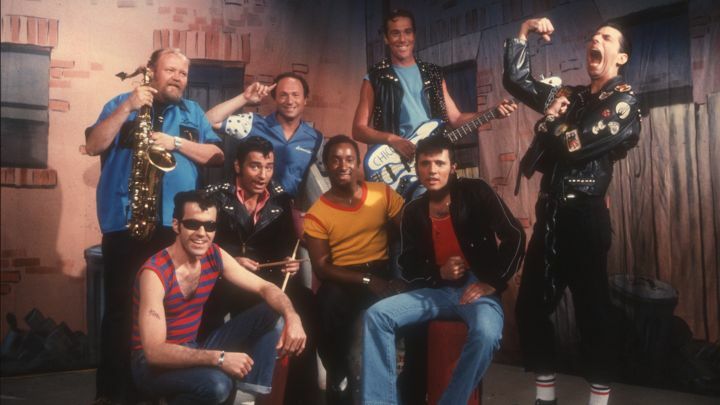 Billing themselves as "from the streets of New York" and outfitted in gold lamé, leather jackets, pompadour and ducktail hairdos, Sha Na Na performs a song and dance repertoire of classic fifties rock and roll, simultaneously reviving and parodying the music and 1950s New York street culture. 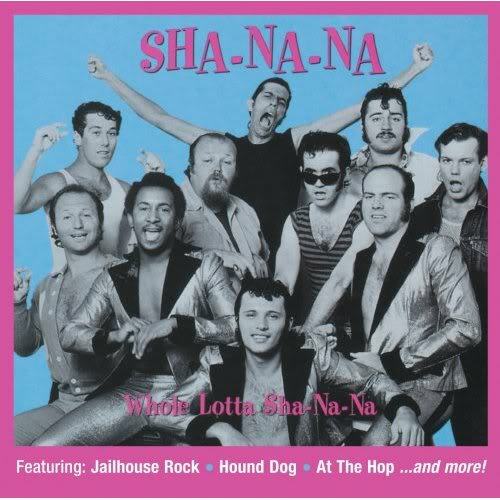 Sha Na Na hosted the Sha Na Na syndicated variety series that ran from 1977 to 1981. Their current touring group features original members Donny York and Jocko Marcellino, and long-time member Screamin' Scott Simon. Simon joined the band just after its appearance at the Woodstock Festival (1969). Everyone else from the original band and TV show has since departed. Current band members include bassist Tim Butler, guitarist Gene Jaramillo, drummer Paul Kimbarow, and sax player Michael Brown. The group began singing as part of the long-standing Columbia University a cappella group the Kingsmen, but changed their name due to the Pacific Northwest group of the same name, famous for covering "Louie, Louie". 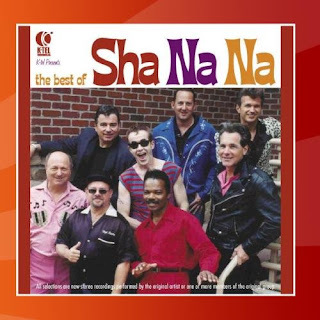 Conceived by George Leonard, then a graduate student in humanities, Sha Na Na began performing in 1969 at the height of the hippie counterculture, and achieved national fame after playing at the Woodstock Festival, where they preceded Jimi Hendrix. Their 90-second appearance in the Woodstock film brought the group national attention and helped spark a 1950s nostalgia craze that inspired similar groups in North America, as well as the Broadway musical Grease, the feature film American Graffiti and the TV show Happy Days. The extent to which their act was nostalgic, as opposed to "invented nostalgia", has been questioned. The group's first manager, Ed Goodgold, codified trivia as a nostalgic quiz game and conducted the nation's first trivia contests with Dan Carlinsky in 1965. 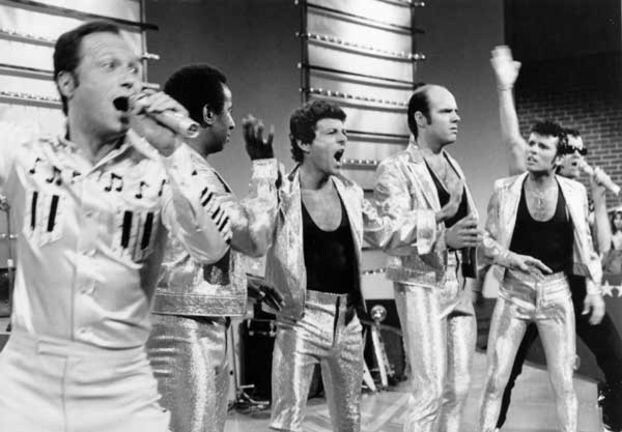 The future Sha Na Na/Kingsmen were featured singers at these contests. Four years later, he co-authored "Rock 'n' Roll Trivia" just as he and the William Morris Agency began steering Sha Na Na's career. From 1969 until 1971, the band played at, among other places, the Fillmore East and Fillmore West, opening for such bands as The Grateful Dead, The Mothers of Invention, and The Kinks. When Sha Na Na began headlining at other venues, one of the opening acts was Bruce Springsteen. In 1972, Sha Na Na was one of just four acts invited by John Lennon and Yoko Ono to perform with them at their One-to-One benefit concert at Madison Square Garden. 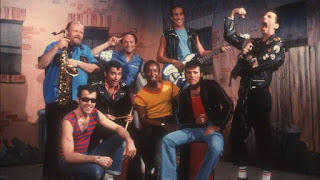 Subsequently, the group appeared in the 1978 movie Grease, and from 1977 to 1982, the group reached perhaps the height of its success with its own hit syndicated television show Sha Na Na, featuring guests such as James Brown, the legendary punk rock band the Ramones, and musicians such as Chuck Berry, Little Richard, Bo Diddley, The Ronettes, and Chubby Checker. The original band line-up featured 12 performers: Alan Cooper (bass vocals), Rob Leonard (vocals), Frederick "Dennis" Greene (Denny) (vocals), Henry Gross (guitar), Jocko Marcellino (drums), Joe Witkin (piano), Scott Powell (also known as Captain Outrageous and Tony Santini) (vocals), Donald "Donny" York (vocals), Elliot Cahn (also known as Gino), (rhythm guitar), Rich Joffe (vocals), Dave Garrett (vocals) and Bruce "Bruno" Clarke. 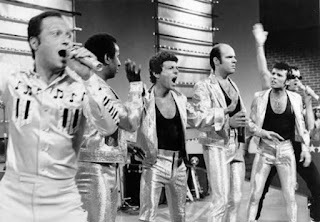 The initial act had three up-front performers in gold lamé and the other nine in "greaser" attire (rolled up T-shirt sleeves, leather jackets, tank tops). The act usually ended after several encores, and closed with "Lovers Never Say Goodbye". 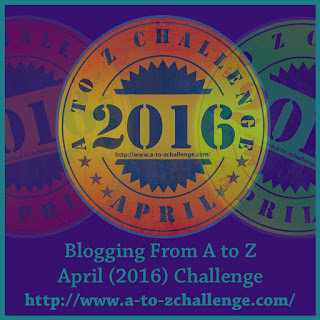 The closing song was changed to, "Goodnight Sweetheart" for the TV series. In concert, they would often return for up to seven encores, and this included when performing in Toronto, at Ontario Place and performing "Hound Dog" after announcing Elvis Presley's death earlier that same day (August 16, 1977).